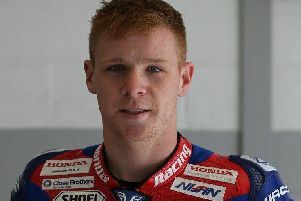 Market Rasen-based Australian rider Jason O’Halloran was still not at his best as the British Superbike Championship headed to Brands Hatch last weekend. Still suffering the effects of a broken ankle from a crash two months ago, and aggravated by a further crash at Snetterton, O’Halloran recorded 14th and 15th-place finishes in the two races. It was a close qualifying session on the 2.4-mile GP circuit on Saturday and O’Halloran narrowly missed out on the final stage by 0.030secs after finishing stage two in 10th, giving him a fourth-row grid position for the first of two 20-lap races on Sunday. Sadly the Australian rider was not in a position to challenge the leaders and completed the race in 14th place to pick up two championship points. Starting the second race from the sixth row, he was again hampered by the pain in his ankle, but bravely finished the race in 15th. Because of his withdrawal from the previous round at Knockhill, and having scored just three points at Brands Hatch, O’Halloran dropped down the rider standings to 11th place on 66 points.